I have a few obsessions and they’re probably baffling or inscrutable to most of my friends and relatives. If you’re a rock music fan, you’ll understand my Bruce Springsteen obsession. But my obsessions with the Spanish Civil War, technology and dystopian societies, and the genius physicists who created that engine of doom, the first atomic bomb, are a little weird, I admit. I’m not going to try to explain them here. But I don’t miss a chance to read about, or see dramatizations of, those topics. And that explains why I really liked a few of the plays I’ve reviewed and seen lately. 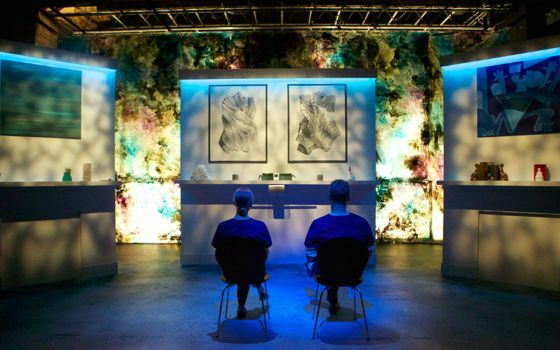 Those genius physicists—Oppenheimer, Fermi, Einstein and Teller—do a song and dance number in this memory play now being performed by a small theater company at the city’s Storefront Theater on Randolph Street. The protagonist is a retired physicist suffering from dementia, who dreams that his memory is radioactive and will allow him to create the next huge weapon of mass destruction. Edward Teller eggs him on, while the other physicists are less sanguine about the idea. Cold Basement Dramatics does a good job with this difficult topic. Mark Maxwell plays the protagonist in an intelligent and graceful style and the rest of the cast is very good too. Playwright Lindner created the character based on a relative who was one of the Manhattan Project physicists. The play has some rough edges but is definitely worth your time and interest. 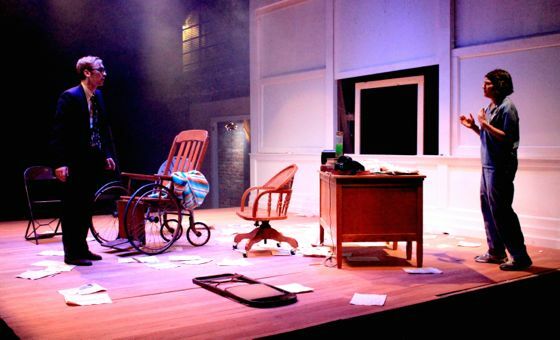 The Half Life of Memory runs thru June 29 at the Storefront Theatre, 66 E Randolph St. Tickets are cheap too! 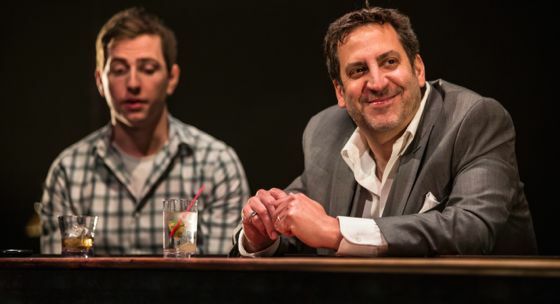 Tyrant runs through June 29 at Theater Wit, 1229 W Belmont. Alex Stage and Marc Grapey at the Hole in the Wall Bar. The play in Goodman’s smaller theater space is a modernized version of Nathanael West’s novella, Miss Lonelyhearts. Rather than being a 1930s newspaper advice columnist, our protagonist is a young man who creates content and code for an internet company. His boss, the funny, fiendish Steve, asks him to start giving advice online to readers who write in with their problems. This becomes a huge success almost immediately, but Aunt Susan doesn’t know how to handle his fame. Nor does his girlfriend Betty. But Steve and his partner/wife Lydia do and they move Aunt Susan to version 2.0. Ask Aunt Susan has gotten a few negative reviews but most are in the “recommended” category, as mine was. The 90-minute play has some flaws and needs some work, but it’s great fun and asks us to question how we maintain our lives today. Plus Marc Grapey’s performance as Steve is not to be missed. Grapey is a terrific comic actor and does a four-star job in this play. Ask Aunt Susan runs through June 22 at the Goodman Theatre, 170 N Dearborn St. I also interviewed playwright Seth Bockley about his thinking on internet obsessions, generational differences, and how he visualizes a play while writing it. Read it here. 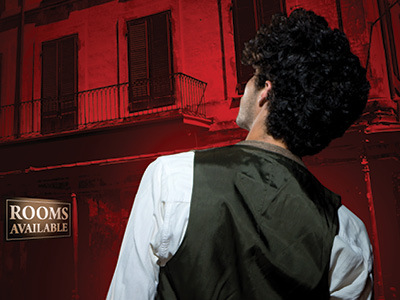 This haunting Tennessee Williams play presents many of the themes of his other works. Loneliness. Failed dreams. Artistic awakening. Poverty. Homosexuality. This is one of Williams’ late plays, written in 1977, and it addresses those themes as he did in better-known works such as The Glass Menagerie and Streetcar Named Desire. This play deserves to be better known. Vieux Carré deals with The Writer (Ty Olwin) as a young man newly arrived in New Orleans and trying to sort out his creative and romantic life, while living in a rooming house in the French Quarter. The denizens of the rooming house suffer poverty, hunger and lost love. Veteran Chicago actor Will Casey plays Nightingale, a gay artist who is dying of tuberculosis and mourning his unsuccessful career. He tries to introduce the younger man to a new love and life style, which The Writer seems to resist. The relationship between the two actors ebbs and flows until its tragic end. Vieux Carré runs at Raven Theatre Company, 6157 N Clark St, thru June 28. 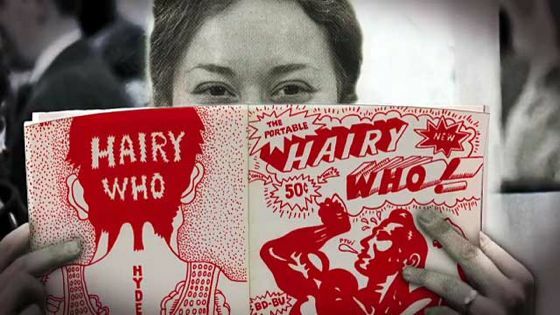 Do you remember the artists known as the Hairy Who from the ‘60s and ‘70s? They were outrageous and confrontational and their work was vividly colored and luridly graphic. You can relive your past art memories in this outstanding documentary, which I just reviewed. It’s having limited showings but you’ll be able to see it in late September at the Gene Siskel Film Center. I’m going to see it again. I saw this excellent indie film last month at the Music Box during the Chicago Critics Film Festival. And now it’s back and showing at several local theaters. It’s directed by Gillian Robespierre and stars Jenny Slate as a young woman standup comic who gets pregnant in a drunken one-night stand (that turns into a tender romance). The performances are excellent, the script is raunchy and fun. Most interesting, the concept of abortion gets rational consideration; it’s not treated as an idea that dare not be mentioned. This is the first film I’ve seen that takes this approach and it’s refreshingly natural and naturalistic. I highly recommend seeing Obvious Child. NOTE: All photos courtesy of the theater or production companies.